I curse the Vancouver winters for the short amount of daylight. Many days, we don’t even get to see the sun…just grey, grey, grey. The lack of natural light (along with our apartment’s low-energy bulbs) makes my photos brown and looking at them right now makes me feel like I’m back in the 70’s. Throw on the corduroy, cozy up in an afgan and settle into an evening of orange and brown. The seventies weren’t so bad, really. My mom took yoga and made her own yogurt and even took a self defense class where she could bust up a 2×4 with a swift kick and a power yell. I made this brown meal after our trip to Portland. Too much good IPA and a stop (or two) for a Reggie Deluxe and we were glad to be back to the healthy drizzle of Vancouver. Portland was all about excess and this meal is about scaling back while still meeting the oh-so-important comfort quotiant. I’ve made Orangette’s braised cabbage a few times and it’s delicious. Sweet and soft and a meal in it’s own right. And even if you are a bit ho-hum on cabbage, the braised carrots alongside are so rich and yielding that you can’t believe that you just got all excited for a carrot. But I didn’t think the husband would be all that happy with a hunk of cabbage on his plate, no matter how bejewelled the carrots were, so I made some brown rice. After a quick look on the computer to see what I could add to make the rice a tad more appealing, I stumbled upon this recipe. Kalyn uses farro, but subbing in the brown rice was a perfect choice. The balsamic added a nice sweetness and tang to the dish and the brown mushrooms just multiplied the earthiness factor to the max. I threw in some barely steamed broccoli for crunch and colour and put on a little Jackson C Frank on the hi-fi. If a meal could make you feel healthy, wealthy and wise, this could be it. Ahhh, much better. 1. In a medium sized pot, bring the vegetable broth to a boil. Add brown rice, cover and turn heat down to medium. When all the broth has been absorbed, rice will be ready. 2. Meanwhile, heat olive in a large skillet. Saute onion, garlic and mushrooms and add in the thyme. When the mushrooms are soft and have released their juices, stir in the balsamic vinegar and season with salt and pepper. Add the brown rice into the mushroom mixture and mix until all the rice has been coated with the mushroom balsamic sauce. Serve. Preheat oven at 325F. In a large oven proof dish, place vegetables into an even layer and cover with stock and olive oil. Give everything a good sprinkle of salt and pepper and cover tightly with a lid or foil. Bake for 1 hour and turn vegetables over if necessary, adding water if dry. Bake for another hour and then serve. I was also raised in the 70’s and have to deal with Pacific NW winters (in Seattle). Photography is very difficult these days! I was born just before the 70s, just a month. But I sure recall living in the 70s. My favourite one-piece bell-bottom coveralls, orange and brown carpeting in my parent’s house, watching “The Electric Company” kids show, wearing Sasquatch boots, that made an unanticipated return two seasons ago…ugh! No thanks! Cabbage is a great vegetable and I really enjoy it cooked but good God, the stench of it really lingers. I have a savoy in the fridge so I might just use your cabbage recipe for it. The rice sounds perfect. 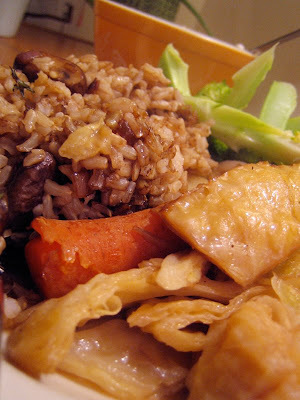 Rice with added extras like mushrooms gets me excited, whereas plain cooked rice – meh! What I love about this is that there are three vegetables on the plate. You might be missing the sun, but you’re not going to be nutrient deficient! Anyway, it sounds like we’re on a similar sun wavelength. Yesterday in Edmonton, we didn’t get even a glimmer of light. Taking pictures is getting tough. Dana, glad I’m not the only one struggling with photos! Kalyn, it was really good. Even my husband who hates brown rice said he really liked it. Ah ha, Bijoux, so you are older than me! 😉 Actually, trust me, there is no awful cabbage stench with this meal. The cabbage slowly cooks in the oven avoiding all stench. Really! it’s true, i’m safe from scurvy, hanne! Ooo I’ll have to try that cabbage. I clicked to see what the Reggie Deluxe was… yum now I want biscuits. And I sympathize with you about the lack of natural light. It doesn’t help that our kitchen is on the other end of the room from the windows. Ha, I was born before the 70s by a few years and grew up in a brown house(built in 1978 by my dad) with brown walls, brown carpet(even in the bathroom! ), brown wood trim, brown wall paper, etc, etc. Now it only has one room with the carpet still down(we are ripping it up after Christmas) and the wall paper and paneling is a tiny bit more modern. 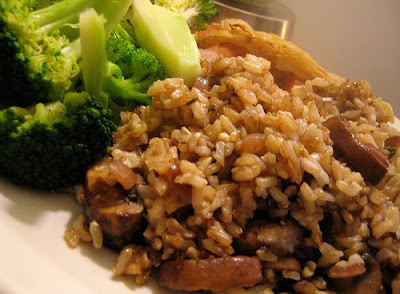 I LOVELOVELOVE balsamic vinegar and mushrooms so your rice sounds fantastic!! I also love cabbage! This will be on our menu soon, maybe not til after payday though. My god, that Reggie Deluxe sounds amazing. I feel as though I must eat the 70’s veggie delight just for thinking of consuming something so sinful! eatme, we have no natural light in our kitchen (which is why you never see any kitchen shots on this blog!) Windows in kitchens should be mandatory! Nice work on the house, Strange! And yes, I think you’d love this rice. It really is pretty great.